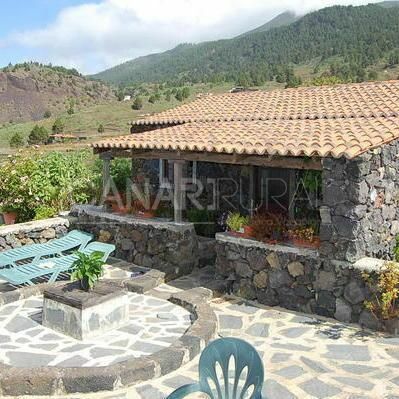 Casa Rural Roberto is a small house with wonderful sea views located in an attractive geological zone called Las Manchas. It is ideal for couples or a family with one child, looking to get away from it all for a few days. * 1 bedroom, with two single beds (90x190 cm) and a sofa bed. * Bathroom with shower. Kitchen/living-room equipped with coffee machine, boiler, electric cooker, vitroceramic hobs, refrigerator, microwave, Television with DTTV. Outside: in a property estate de 3000m², barbecues can be enjoyed. * Animals permitted if previously requested. Las Manchas is located in one of the most active geological zones in the world at present. La Cumbre Vieja, and its final hot spring was, in fact, the place in which seven eruptions took place in La Palma since the 16th century. The surface of Las Manchas was destroyed 3 times during this period. The Llanos de Aridane region offers you all types of sporting activites, such as water sports on the Puerto Naos beach, as well as footpaths for hikes on the outskirts. * 1 bedroom, with two single beds (90x190 cm) and a sofa bed. * Bathroom with shower. Kitchen/living-room equipped with coffee machine, boiler, electric cooker, vitroceramic hobs, refrigerator, microwave, Television with DTTV. Outside: in a property estate de 3000m², barbecues can be enjoyed. *Free wiffi internet connection * Animals permitted if previously requested. Delightful Casa with unequalled views! Casa Roberto was a perfect place for our stay. Well placed geographically for all the hiking we planned and equally convenient for restaurants and general shopping. The Casa has great charm. The owner gave us a most wonderful welcome which was much appreciated. The garden is pretty and has a number of unusual plants. The views from the terrace are stunning! Sunsets of deep colour while watching the lights of the fishing boats twinkle out to sea. Here you have an excellent mix of coast and country. There is a wood fired BBQ too! Enjoying the pretty outside eating area under the tiled roof gave us enormous pleasure. Las Manchas is located in one of the most active geological zones in the world at present. La Cumbre Vieja, and its final hot spring was, in fact, the place in which seven eruptions took place in La Palma since the 16th century. The surface of Las Manchas was destroyed 3 times during this period.